CORONADO — A group of residents in the city of Coronado is leading an effort to bring a public dock to Glorietta Bay, as part of the city’s planned project to rebuild a Glorietta Bay Marina dock. 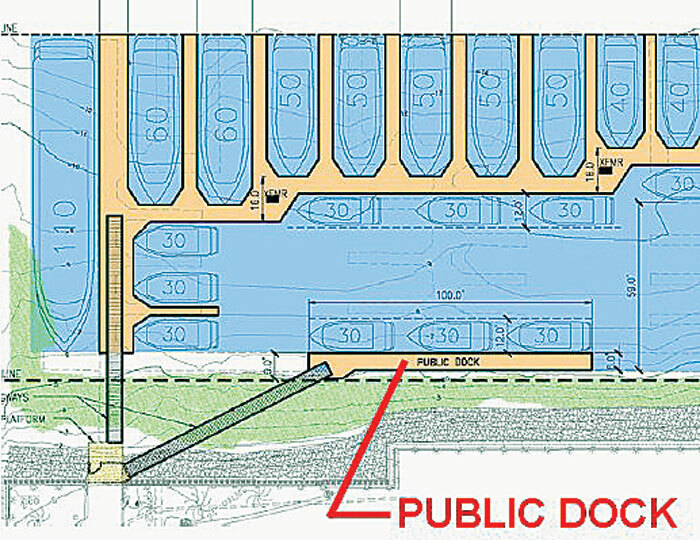 The city council will discuss the proposed dock at its next regularly scheduled meeting. The Glorietta Bay Heritage Group — a group of residents interested in protecting and preserving Glorietta Bay, and improving access to it — initially proposed the concept of a public dock to city representatives in May. The idea was presented as one of three options for the rebuild of Dock C at Glorietta Bay Marina, in a city council staff report. “Glorietta Bay has a history of being a wonderful place to spend time on boat,” said Kevin Reilly, a spokesman for the Glorietta Bay Heritage Group. “It has always been a great place for recreational boating and especially well-suited for small boats.” Boaters attended a public workshop to discuss the potential dock on May 16. The Glorietta Bay Heritage Group has proposed 200 lineal feet of public dock space for boats 30 to 50 feet in length, to be used by visiting boaters — giving them a place to tie up for a night’s stay, or to “dock and dine” at local restaurants. A portion of the dock would be allotted for vessels to stay overnight and another portion would left open for short-term pickup and drop-off of less than three hours, according to plans. In the one option detailed in the report that included a public dock, the dock was planned to be 100 feet long. The Heritage Group believes use of the dock should be free for everyone except overnight visitors, with time limits imposed during the day if crowding becomes a problem. Interested in providing boaters with more destinations in San Diego, the group said it believes adding a public dock in the bay will provide boaters a place to tie up and explore the various restaurants and stores nearby. “Glorietta Bay is a perfect destination for a boater,” he said. “It has the only anchorage open seven days a week. And it gets a lot of use because it’s a secluded little bay that has hotels nearby, a golf course and little beach. “It’s a great place to spend time on your boat, if you want to get away from the roaring crowds,” he added. If approved, the dock would be a component of the Glorietta Bay Marina’s Dock C rebuild project. “We are trying to get the idea across that if the city is going to spend all this money for a few boat owners, then why not do something for the public at the same time?” Reilly said. The group believes public agencies such as the Division of Boating and Waterways or the California Coastal Commission may be able to provide funding for construction of the dock, which would increase boater access. Glorietta Bay Marina is owned by the city of Coronado and has three dock structures: A, B and C. A and B docks were rebuilt in fiscal year 2007. Dock C is deteriorated and in need of replacement, according to staff reports. Boaters can currently anchor in A5 anchorage, rent a slip at Glorietta Bay Marina or tie up at the public dock near the launch ramp. Reilly plans to provide public comment on the proposed dock at the next city council meeting.